We can’t afford to sack the coach, so let’s give him a raise and ask him to think! The friendlies against Albania and Algeria were indeed useful. They should have helped some clubs figure out if they should sign free players like Pantilimon, Tatarusanu, Nicolita, Rat or Marica and other clubs if it’s worth spending money for the signatures of Grigore, Pintilii or Tanase (I’d advise them for free against such a move…). They also helped Piturca introduce some new faces into the team, like the very young Manea of the better-looking-with-each-season Matei, but they probably failed to convince the stubborn coach that this 4-2-3-1 turning into 4-1-4-1 lacks the right players to provide better results than we’ve seen in recent years. – we’ve been searching for years for a right back and all we’ve came up with was Astra’s Matel. The 16 years old Manea is just a promise, while putting Chiriches there (like it happened vs Algeria) simply makes no sense. – on the left side we have the ageing Rat, now 33, and not even a convincing backup solution in Latovlevici. – we don’t have a no 8 type of midfielder, apart from PAOK’s Lazar. In front of the defense, Piturca uses Bourceanu and Pintilii; a poor choice, as having there two players with the profile of a no 6 simply keeps your team highly ineffective in keeping possession and building-up he game. Not to mention that their passing skill and vision also affect Romania’s ability to counter. – we don’t have wingers who can combine pace, skill on the ball, finishing ability. All of them have either one or two of these vital assets. Chipciu, for instance, is one of them… and plays in the middle. – our wide midfielders are Popa (who only has pace), Nicolita (who only has the will to run), Tanase (who can’t use his left foot and his brain), Maxim (who has skill and some pace, but feels better in the middle). – we don’t have a number 10 (Chipciu is a winger turned into a supporting forward) or, better said, we don’t want a number 10, because we only counter. – we don’t have the striker able to play alone upfront. Marica will speculate every once in a while a lucky ball behind the defense or an error from the opposition, but he cannot win aerial duels, hold up the ball, allow the team to come in support. He’s not the right type of forward for such a role. If any of the above makes some sense, it’s bad. In fact, it’s really bad. Because I am not even a coach. I do, however, judge the players’ performances, ability and potential for a living and I can tell you this: in spite of Piturca’s efforts to promote different players (remember Grozav, who only convinced Terek and in the end failed to make it even there? 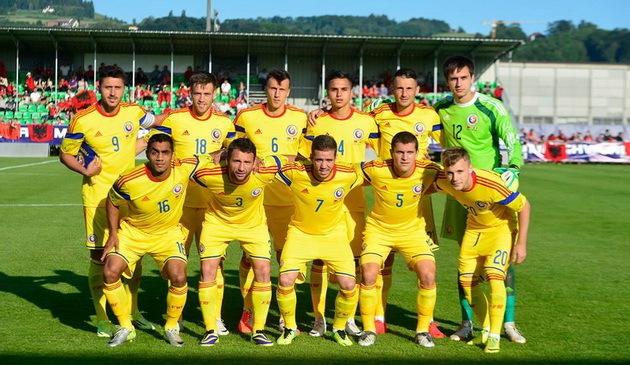 ), Romania’s poor looking 4-2-3-1 gets back at the very players that fail to make it work. And makes them look limited, inconsistent, promising at times, but eventually unconvincing.